Adjustable ball mount with sway control tab. Can be used in rise position up to 3-3/4" or in the drop position up to 5-1/4". 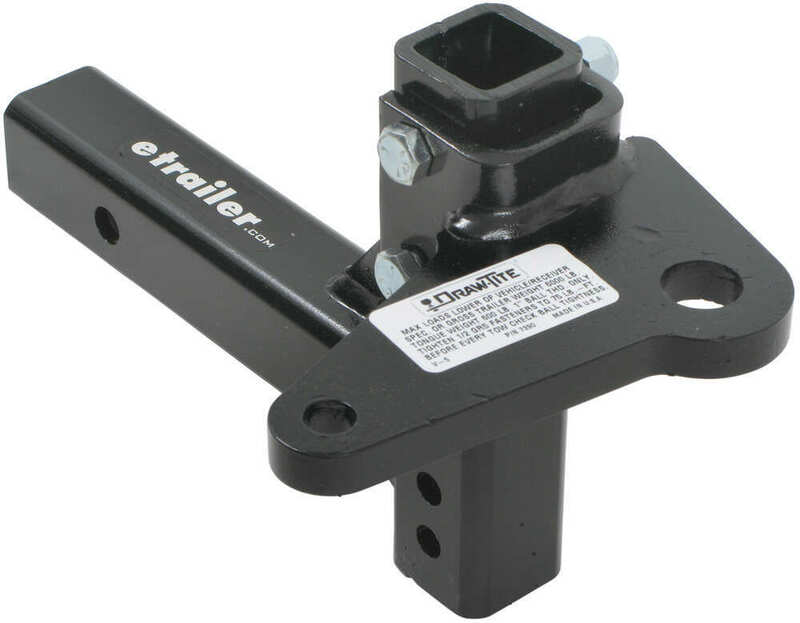 Call 800-298-8924 to order Draw-Tite ball mounts part number 7390 or order online at etrailer.com. Free expert support on all Draw-Tite products. 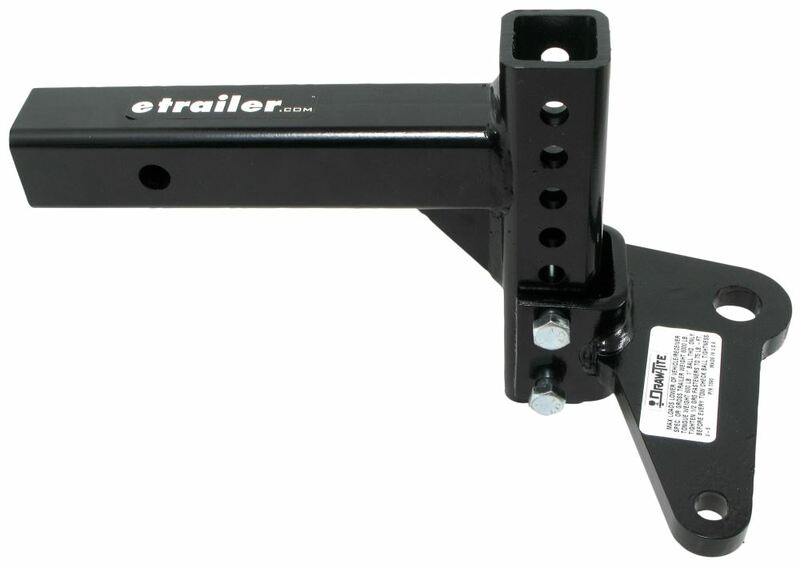 Guaranteed Lowest Price and Fastest Shipping for Ball Mount Adjustable with Sway-Control Tab, 6,000 lbs. Ball Mounts reviews from real customers. Height adjustments in increments of 1"
Between hitch pin hole and closest edge of support brace: 4-5/8"
Between hitch pin hole and closest edge of upright: 6-5/8"
Sturdy steel ball mount with hollow shank measures 7-1/2" from center of hitch pin hole to center of ball hole. 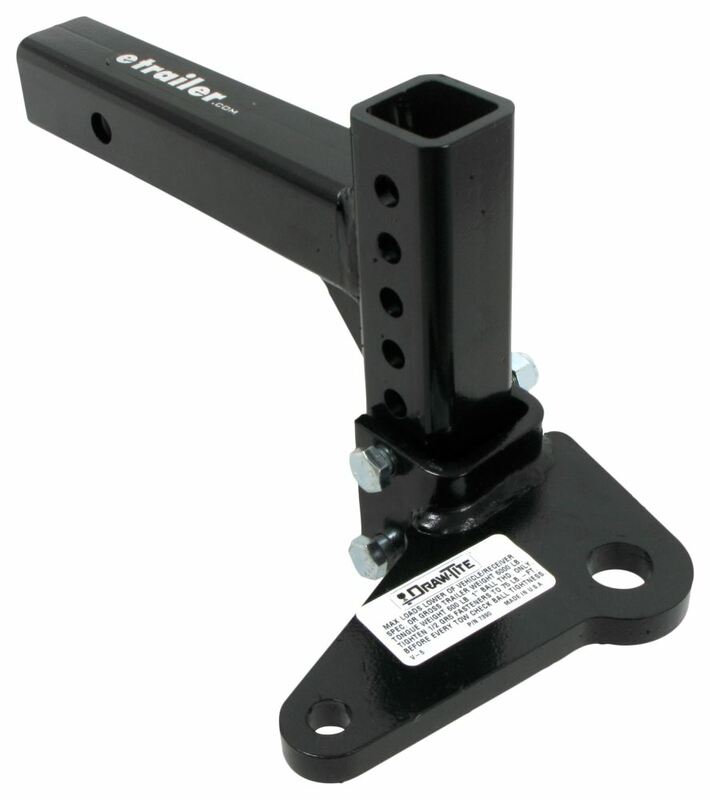 Built-in bracket lets you mount a sway control ball for simple installation of a friction sway control system. 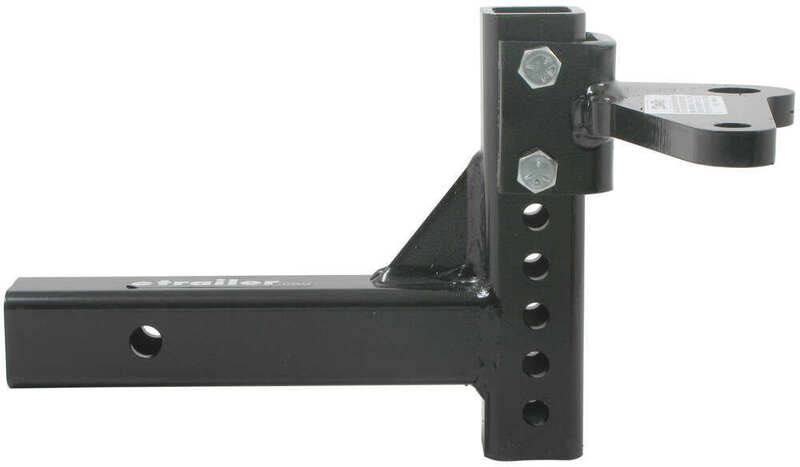 Today we're going to review part number 7390, this is the draw tight, adjustable, hollow shank ball mount with the sway control tab and a six thousand pound weight capacity. This part is rated at six thousand pounds gross towing weight capacity and up to six hundred pounds tongue weight capacity. It does include this two inch by two inch square hollow shank and this shank has the holes going up and down on it. It is an adjustable shank that can be used in either the drop position like this, or if you flip it over, it can be used in the rise position. The ball platform, this is where your hitch ball would be attached and this is where your ball for your sway control would be attached that basically would slide up and down on there and these holes for the adjustment are at one inch increments, so just like that. That's in the rise position and I had mentioned you can also put it in the drop position and you can do the same thing when you put the bolt .. it comes with the bolts and the lock nut, so same way. You can do it up and down in the drop position and the other nice thing is that this platform, you can use it for left or right hand sway control attachments. You can put it on this way, or you can flip it the other way and put it on this way. This does require the ball platform has a one inch diameter hole so it does require a hitch ball with a one inch shank diameter. We do sell those on our website separately. The thickness on this platform is five eighths of an inch thick. I want to give you an idea, and again, this comes with the hardware, I'm going to put it at the lowest position so the maximum drop position. Basically what you would do is go ahead and just put it on the lowest. There we go, put the bolt through, put the other bolt through and then you would put your lock nuts on there but I'm going to try to give you measurements. This is in the maximum drop position, so the drop I'll measure from the top of the ball platform to the top of the shank. If we put a ruler on that, you can see it's going to be right at five and a quarter inch maximum drop. If we change this around, I'm going to put it in the maximum rise position. That would be flipping it around this way and we'll put it all the way up here. Let's go ahead and drop it in. There we go. Now it's in the maximum rise position and again, it's measured from top of the shank to top of the ball platform. If we do that, you're going to see it's right at three and three quarter inches in the maximum rise position. That should do it for the review on part number 7390, the draw tight, adjustable hollow shank ball mount with the sway control tab and a six thousand pound weight capacity. 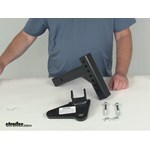 Order: RelevanceNewestRating - High to LowRating - Low to High Adjustable ball mount with sway control tab. Can be used in rise position up to 3-3/4" or in the drop position up to 5-1/4". We did another cross country trip. Had a blow out. The hitch held up perfect. So far so good. Over 6,000 miles on it. You can pick up a ball mount like the Curt # D320 with a sway control tab that offers 4 inches of drop right here on this page! The Draw-Tite # 7390 is adjustable between 3-3/4" of rise and 5-1/4" of drop and has a 6,000 lb towing capacity and 600 lb tongue weight capacity. 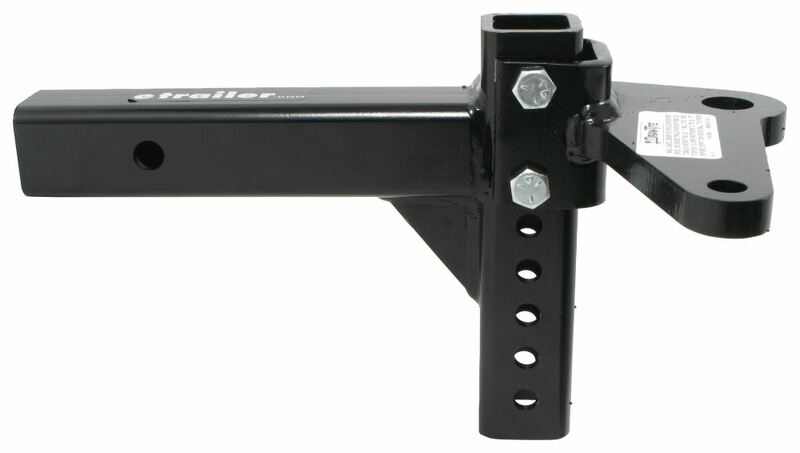 Your other option is to use a ball mount with a 4" drop and 7,500 lb capacity such as the Draw-Tite # 2753 with Reese Sway-Control Bracket # RP26003. The distance between the holes on the Ball Mount Adjustable with Sway-Control Tab, 6,000 lbs, # 7390, is 1-1/4 inches, center to center. 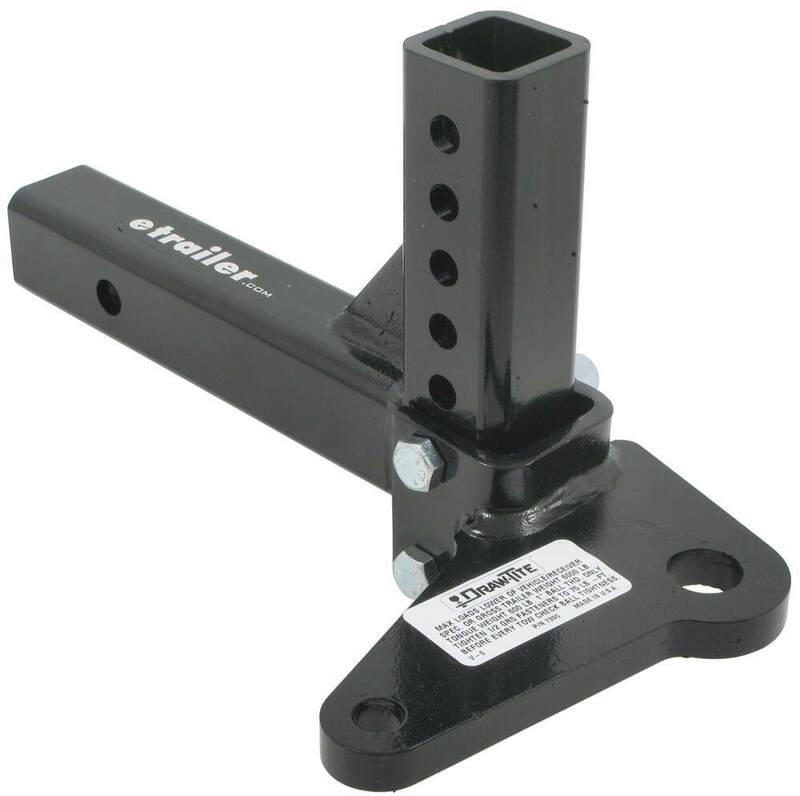 When installing bar style friction sway control the measurement needed is actually from the center of the ball cavity on the trailer coupler to the center of the sway control ball mounted on the trailer frame. That measurement should be 24 inches (take a look at the linked instructions for # 83660 as an example). I have also linked a video that will help. Yes, the shank hole on the Draw Tite Adjustable Ball Mount part # 7390 is 5/8 inches which is same diameter as the shank diameter of the Curt Sway Control Hitch Ball # C40093 you mentioned. 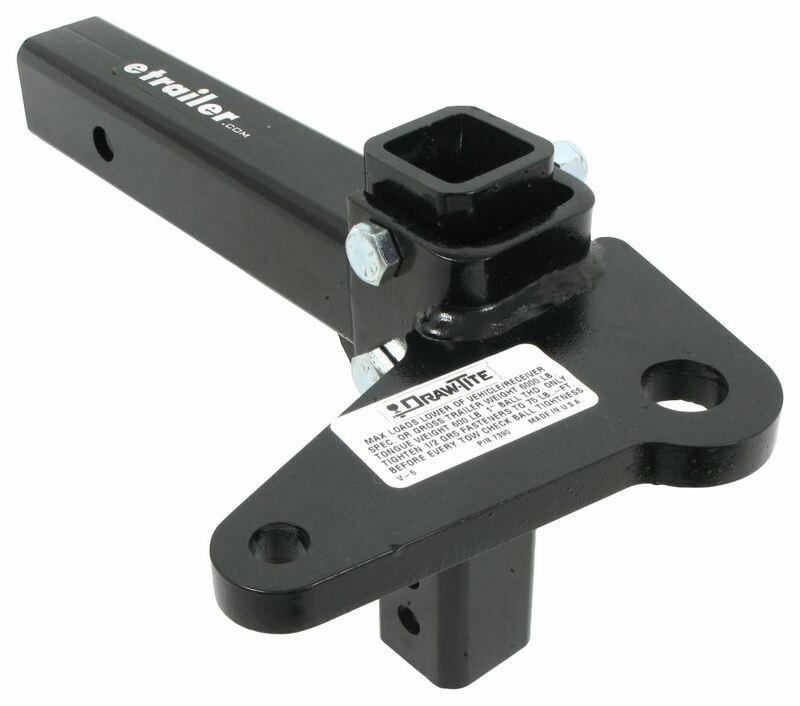 The only option we offer for an adjustable ball mount that has a sway control tab mounted on the platform is the Draw Tite part # 7390. It does require you to install a hitch ball on it though so for a way to have multiple ball sizes you would want the part # 900B. 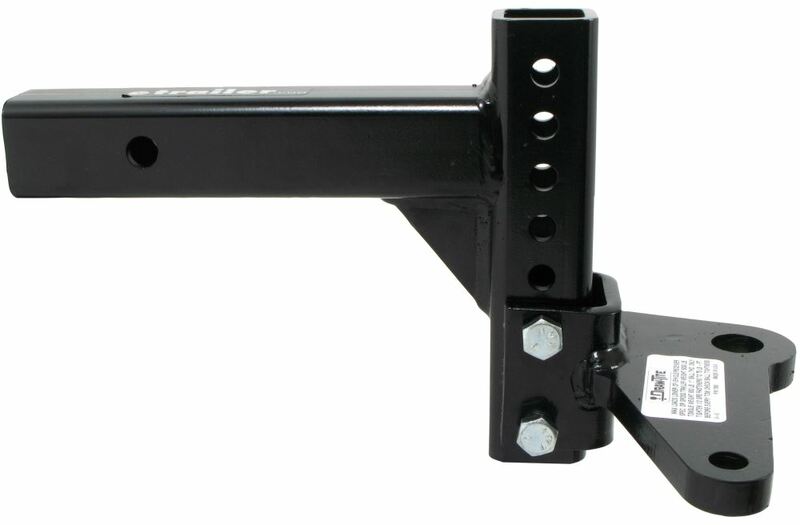 I am not sure how much your trailer weighs but if it happens to be under 6,000 pounds you could use adjustable ball mount with anti-sway bracket, # 7390. 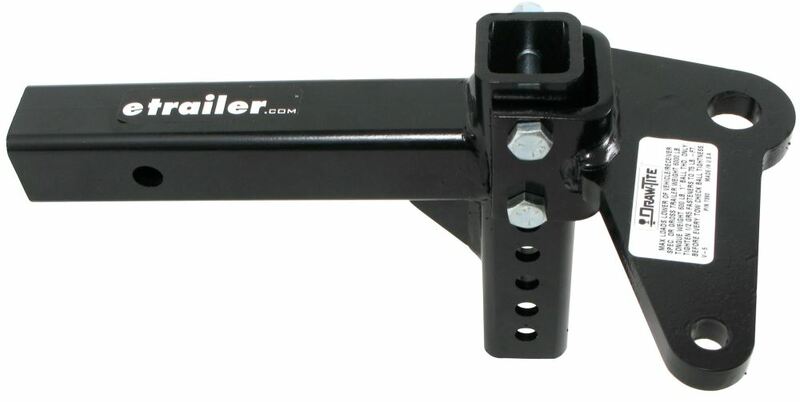 It is currently the only adjustable ball mount we carry that also has a sway control bracket built in. Yes, you can use the Adjustable ball mount with sway control tab # 7390 with the Curt friction sway control bar. The shank on the ball that will mount to the tab on this ball mount is plenty long enough and is in the right position so that the sway control unit is at the proper angle. The Draw-Tite Ball Mount Adjustable with Sway-Control Tab # 7390 is designed to only be adjusted with the bolts and nuts included. This is more similar in design to a weight distribution system head than a traditional adjustable ball mount due to the sway control option. The shank can use the standard pin and clip # PC3 at the hitch pin hole if desired or you can use a locking hitch pin like # 7683. This system is designed for use with a friction bar sway control like # 83660.